1. Why web design prices are big different? Qestion: I (client) have contacted 3 different web design companies before but the price difference is too much. Why? I do not know how make a decision. 2. Low quality customized design website. 3. High quality customized design website. Shanghai PassionSource company only design and develop high quality customized website. If you have more questions please contact us. 2. Can you take over web project from other web design and development company? My website was made by another web design and development company. Now I am not satisfied with the website design, or the website development time delay, or that company was closed. Can your company take over the uncompleted web project? It depends on the detail situation. If you can supply all design source files and program source codes of your website to us, then normally we can take over it. Otherwise without your website design source files and program source codes, we can not update your website. In this case, we suggest to redesign it. If you can supply all soure files and source codes t us, then we will check the source files and source codes first. If the quality of source codes is very bad, we will suggest to redesign or rewrite it. Sometimes a few clients asked us above question, we understand that the client meet trouble. Now here we remind that if you try to find a web design company to design your website, please make sure that you will get all design source files and program source codes after website is completed. Then it will be easy to update your website in the future. 3. What is wire frame? Wire frame pages, are the mock up page of Photoshop web pages. Wire frame page can be supplied by our clients or by our designers. The content of wire frame page includes navigation bar, menu, every text/picture section...etc. Wire frame pages can be made through photoshop software or other office softwares such as Word, Excel, PPT. 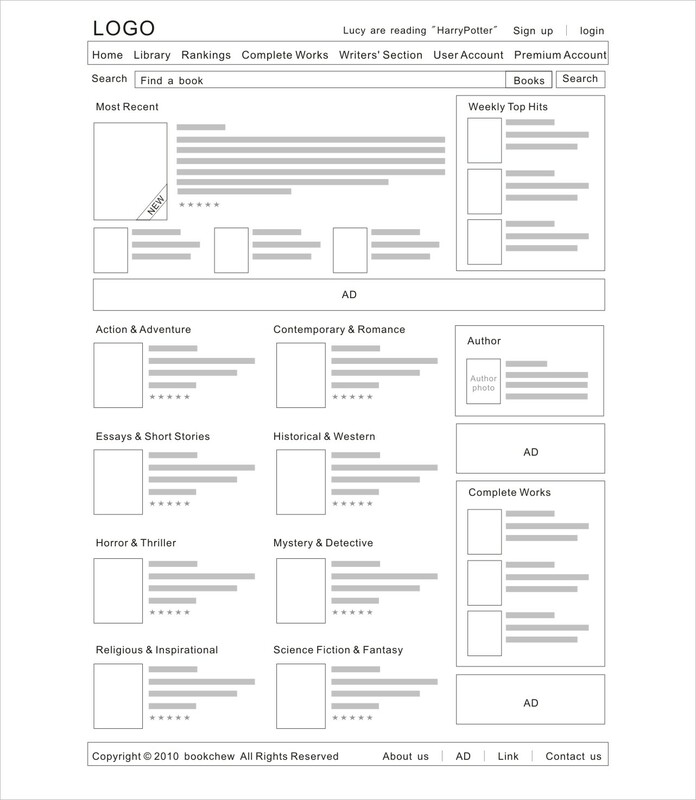 Please check sample of our wireframe. 4. After web design contract signed, what's the detail content for one year free website maintenance? 4. Links of texts or pictures updates. 4. The deleted/removed program functions that clients request won't affect other program functions on website. 5. I am not in Shanghai, then how we communicate with each other? Now Shanghai PassionSource only have offices in Shanghai city and Hunan Province, we did not setup any branch company or agent in other countries or other cities in China except Shanghai. If our clients are not located in Shanghai, we can discuss web project details through remotely communication. Remotely communication will save our time/money on road between cities or countries. Many of our American and European clients did not meet us face to face, we just communicate through Phone/Email/MSN/Skype/QQ/Net meeting. To ensure remotely communicate successfully, the key point is PassionSource and our clients discuss/write down "web design detail requirement" document or "website detail programming functions list" document. We can attach them as appendix of our contract, then sign it. The final work result of web design that we sent to our clients are digital web pages, not real products. So every step of web design can be discussed/confirmed through remotely communication between us and our clients. If some of our clients wish PassionSource send staff to meet in other cities or other countries, the clients need to prepay us the fee of travelling expense. 6. What are the key steps for web design? 7. How long it will take for web design? The total design and development time depends on how complicated your website is, more complicated website, more development time. The simple website could be completed in 2 weeks, the complicated website could take us more than 6 months to finish. A common delay for web design, is the design confirmation from our client. During the different steps of web design & development process, we need our client to confirm some key steps then we can move forward to next steps. If our client is busy and can not confirm key steps in time, then may delay website design process. 8. To start design a new website, what kind of website materials I need to supply? 1. You detail design requirements document. If you do not have it, please download it from our website. Then fill it and send it back to us. 2. Your company logo. If you do not have one, we can design a new company logo for you, but our designer need your own idea/instruction for new logo. Such as main colors. If client company already have a perfect VI system, then please send it to us. 3. Your company brochure, printed brochure is fine. It can help our designer to make a harmonious web design with your company VI (logo, brochure). 4. Your company introduction texts or pictures. 5. What are your favourite main colors for website? what are your favourite sample websites? These above 5 points are important instruction to let our designer to design a website that meet your own requirements. 9. We supply all web page designs, can your copany take HTML web pages and program function work? But let us just to point out one thing, the web pages designs must be PSD (photoshop) format files, and must be designed by professional web designer, not by non-web graphical designer, because if a graphical designer who are not familiar with website design may has shortage of computer screen resolution, page navigation links, user friendly...etc. Then may cause the final web pages looks not professional. 1. Will you supply all source codes after website is done? Yes, also we can supply all PSD photoshop format design source files. But both program source codes and design source files can only be sent to our client after all payment is paid. Just let us point out one thing, if client get our program source code and client find other people to update/change our source code then cause website runs failed, our company will not take any responsibility for this and will not take website maintenance work for our client any more. 2. Do you use open source CMS system? Now in the web development market, there are many outstanding open source CMS system free to use, such as wordpress, shopex...etc. However, we do not like to use open source CMS to develop our clients website, we like to develop our own CMS system. 1. If CMS code is programmed by our programmer, then our company can better control the CMS code quality, and easy for us to develop more flexible functions based on our clients detail requirements. 2. There are too many open source CMS system, it''s difficult for our programmer to understand every of them. It will take us long time to understand/update them. On the other side, some of open source CMS can not be allowed to used on commercial websites, and a hacker may find program bugs on open source CMS and then he can hack thousands of websites - this is not what we expect. 3. What are the web programming language your programmer used? 1. Php, with mysql database. 2. Asp.net(C#), with ms sql database. Several years ago, we also use old ASP programming language, but from year 2002, Microsoft company developed new upgraded web language Asp.net, asp.net is more powerful to use. 4. What is dynamic website? what is static website? Dynamic website is, saving website texts, pictures in website database file, then website administrator can login website back end to manage all texts/pictures data (add/edit/delete) in database. Usually we also call dynamic website as CMS website. CMS full name in English is Content Management System. The content in front page could be managed at the website backend by administrator, operations includes modification, addition and deletion. It need database support. CMS is used in content of sections need to often updated, like: product management, news management. In order to ensure the quality of the code and the maintainance and extendibility of the program, Shanghai passionsource only use CMS developed by ourselves to develop our clients' website and won’t use the open source CMS developed by the 3rd party. But we would use the module or plug-in integrated in program. Tips: the gif animation picture and flash animation are not dynamic web page. 1. What is your logo design work flow? 1. After we received logo design task from our client, according to clients needs, our designer will design out 3 different design style logos, then send to client to choose. 2. Client choose one of logos, next our designer improve/adjust the selected logo. 3. Finnally logo is confirmed by client. 1. What is SEO (search enginee optimazation) content? There is a SEO expert described common SEO methods and FAQs in a graphic picture, please visit SEO FAQs page. 1. Why website hosted in China need ICP license? ICP license rule was made by China gov, all websites that hosted in China mainland need to apply ICP license. Free ICP license for common websites, Bussiness ICP license for e-commerce websites. PassionSource can help our client to apply Free ICP license without any fee.